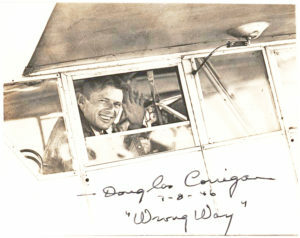 CORRIGAN, DOUGLAS “WRONG WAY.” (1907-1995). American aviator best known for his unauthorized transatlantic flight in 1938. ALS. (“Douglas Corrigan”). 2pp. 8vo. N.p., July 8, 1946. To Ernie. 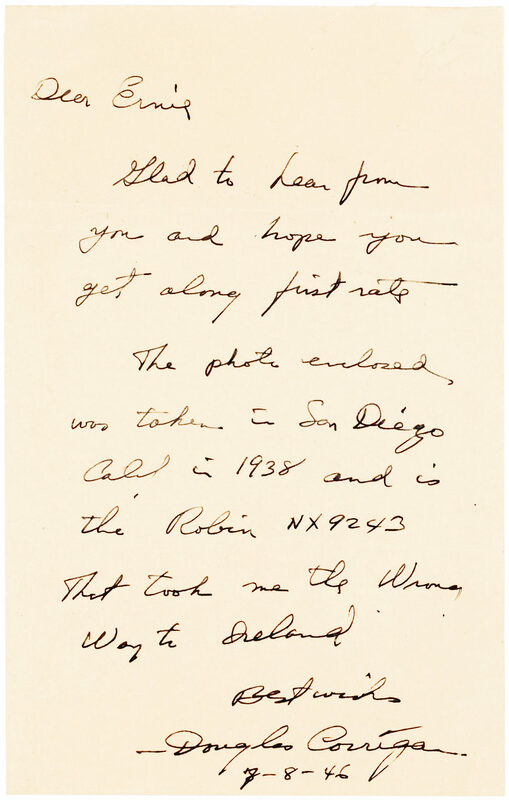 Accompanied by a black-and-white SP of Corrigan looking out of his airplane’s window, waving and smiling. (“Douglas Corrigan ‘Wrong Way’”). 12mo. [San Diego], July 8, 1946. “Glad to hear from you and hope you get along first rate. 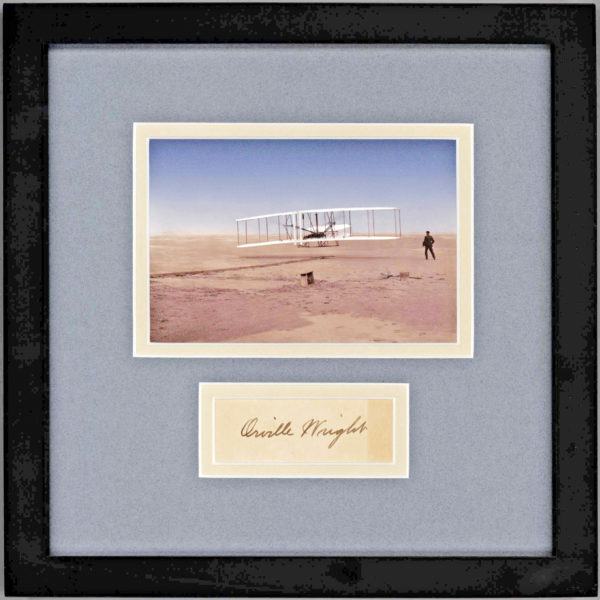 An early interest in aviation led Corrigan to a job at Ryan Aeronautical Company where he helped construct Charles Lindbergh’s record-setting airplane The Spirit of St. Louis. 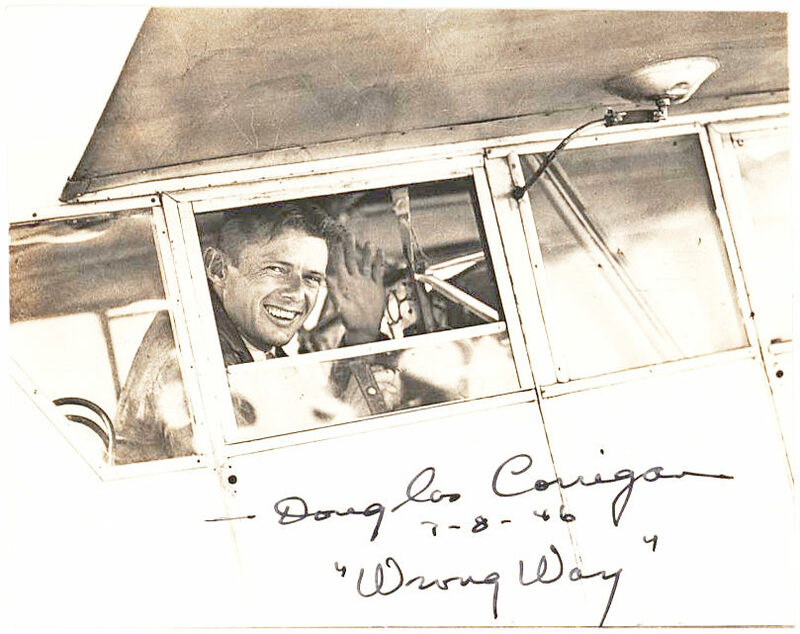 Inspired by Lindbergh, Corrigan set out to duplicate the famed aviator’s feat, taking work as a flight instructor, aircraft mechanic and barnstorming while honing his skills as a pilot. Despite having his application for a transatlantic flight rejected for safety reasons by the Bureau of Air Commerce and making an aborted attempt at an unauthorized transatlantic flight aboard his secretly modified, though ramshackle, Curtiss Model 50 Robin B, Corrigan again flew from San Diego, California to Floyd Bennett Field in Brooklyn in July 1938, the event depicted in our photograph. He was granted permission to use one of the airport’s runways for a return trip west to California but upon takeoff he flew east, later claiming that he did not notice his error until he had been aloft for 26 hours, however his aircraft had been modified to carry two additional front-mounted fuel tanks. After a 28-hour flight Corrigan landed in Dublin, having crossed the Atlantic solo with no radio, a 20-year-old compass and a dangerously leaky gas line. 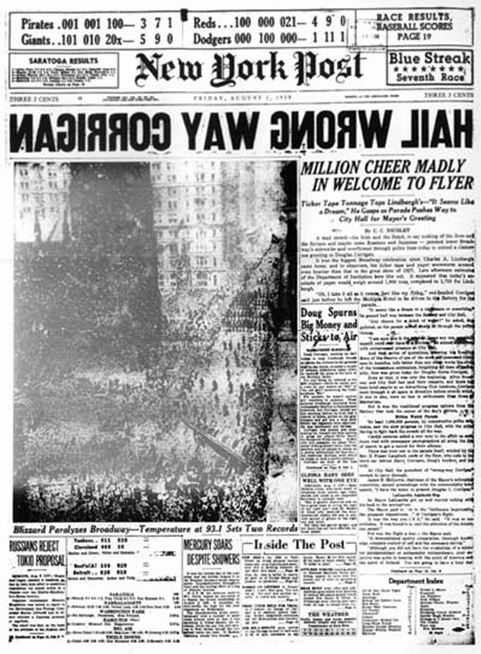 For breaking a wide variety of regulations, Corrigan had his pilot’s certificate revoked for two weeks, but his sensational feat captured the imagination of the American public and he returned to ticker-tape parades in New York and Chicago. Capitalizing on his fame, Corrigan penned a biography, That’s My Story and starred in the 1939 biopic The Flying Irishman. During World War II he tested bombers and in 1946 he unsuccessfully ran for California’s Senate seat on the Prohibition Party. 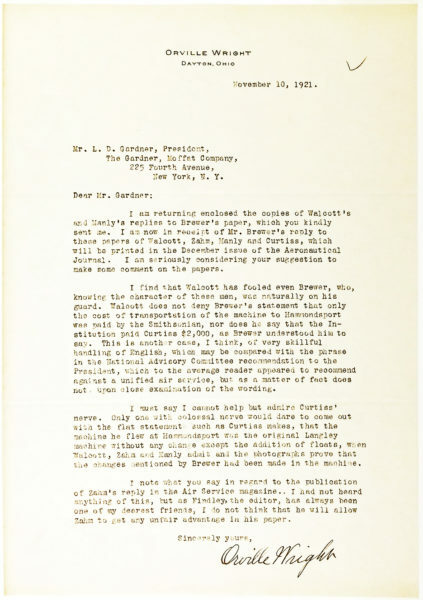 The letter is in very fine condition as is the photograph, which is signed on the lower light portion. Bearing the ink stamp of “Erikson The Flying Photographer” of San Diego on the verso.